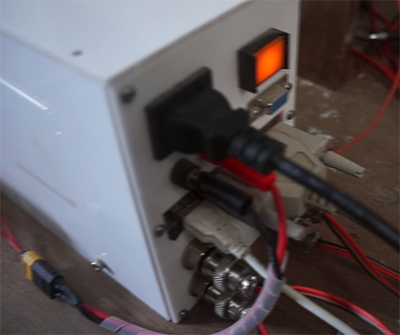 4 Axis DIY Hot wire CNC for RC Hobbyists, Aeromodellers and Designers. Did you ever wonder, if you could convert thermocol, styrofoam, EPS, EPO, XPS foam available as packaging , or insulation, or in form of blocks or sheets into beautiful RC airplane wings ? 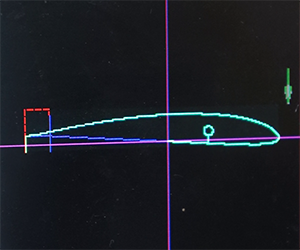 Or cut that custom airfoil that gives the best glide time for your college project ? 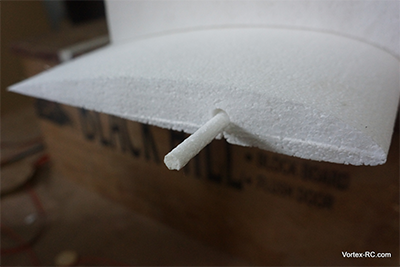 Or cut foam cores that could be used for Vacuum bagging and build that extra neat UAV Carbon fiber wing. Or be a star amongst your local flying club to give out custom airfoils to fellow friends and fliers . 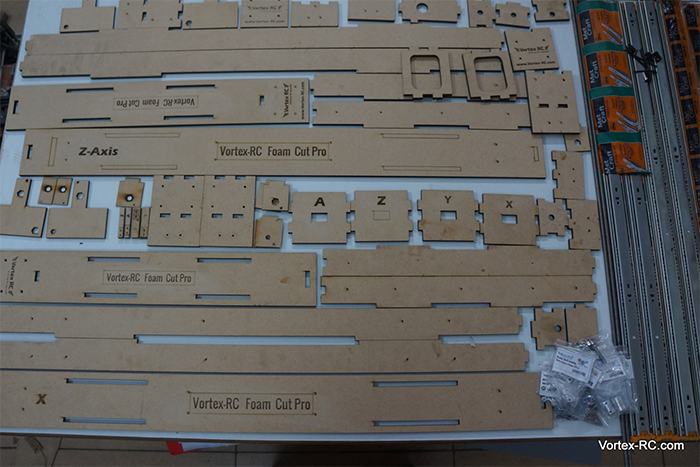 Kit Includes Laser cut Precision Interlocking Parts and Complete Hardware for the build. Assembles to form the full 4 Axis CNC. Bring an end to buying expensive foam wings, and also to manual hot wire cutting and start making RC model wings professionally and easily using our DIY 4 Axis Hot wire CNC. Our DIY 4 axis CNC Hot wire foam cutter is ideal for aeromodellers, RC enthusiasts, it lets you cut your choice of airfoil, complete with spars and all into your choice of foam, effortlessly, and with extreme accuracy in minutes. Full 4 Axis CNC operation – Cut almost any airfoil, Tapered wings and Fuselage sections in foam easily. Can cut Letters, designs, shapes, logos, signages in foam, only creativity is the limitation ! High quality Laser cut precision interlocking parts ensure accuracy , precision, mechanical rigidity and durability. Double Nut design reduces backlash and yet keeps the cost low. Cuts EPS, XPS, EPO and EPP foam types easily. *Applicable to kits with Electronics. This is a complete DIY Kit, that will enable you to assemble your 4 axis Hot wire CNC and includes all the laser cut parts, and hardware but does not include any electronics. Our build video is a perfect guide that shows step by step assembly instructions. 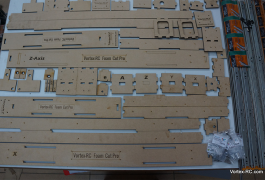 Complete Laser cut Precision Interlocking MDF parts. Complete set of High quality Stainless steel Nuts and bolts. Helical couplers and Limit switches. Basic Kit will allow you to assemble the 4 Axises as above, without any electronics. 4Nos. Nema 17 Stepper motors, 4 stepper drives, Power supply, and a CNC breakout board to start operating the machine. 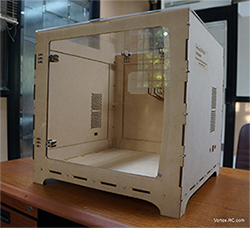 This is still a DIY kit, and will require you to assemble your machine. 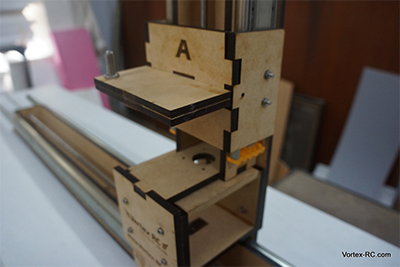 So much fun in making pieces of wood form a fully automated wing making machine . Learn all the way ! A perfect summer or winter project to do ! 4Nos. 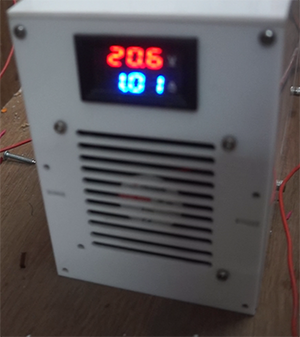 Nema 17 Stepper motors, stepper drives, Power supply, a CNC breakout, Digital Voltmeter/Ammeter , Hot wire voltage regulator, connectors, cables plus a custom acrylic enclosure for the electronics. Ok for those, who are short of time, this variant gives you a fully assembled tested machine, which will be require no assembly ( except for tightening around 8 bolts, and plugging in a few cables ) and will get you started with your machine in less than an hour ! All electronics and hardware included. Only required is a computer with a parallel port running Windows 7/XP 32 Bit. 1. What is a 4 Axis Hot Wire CNC and what can it be used for ? A Hot wire CNC uses a hot wire to cut foam, andthe wire is driven using stepper motors, which are driven by a computer. End result ? You can cut any airfoil, or design, precisely and accurately. Does not require any templates, and the speed of the wire is maintained constant by the computer to the panels cut are absolutely professional. 2. Why so less, when other similar kits comes 4 times as much ? 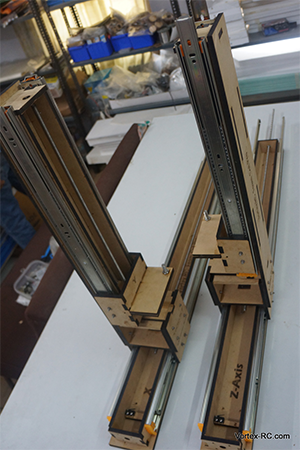 -We have used mass produced drawer slides instead of expensive linear guides and rails ( which costs 10x as much. -We have used a double nut mechanism that reduces the play and backlash, and yet is many times cheaper than a ball screw. – We have used a unique interlocking design that makes the entire frame rigid, sturdy and durable. 3. What Softwares do I need to use this machine. You will require Mach3 Software to run this machine. This can be downloaded from the Mach3 Website. In addition you will need a software like Profilii to generate the G-Codes, OR use our upcoming library to download/generate G-Codes for popular airfoils. 4. What Computer Hardware do i need to use this machine. You will require a Personal Computer running Windows 7/XP 32Bit with a parallel port to operate this machine. This is a requirement of Mach3 software. Consult their website for more details. 5. I am new to CNC. How do i get started ? Welcome to the enchanting world of CNC. You will remember the day when you will cut a piece of scrap foam to cut out a beautiful airfoil. Start by watching our build videos to see how to assemble the kit. 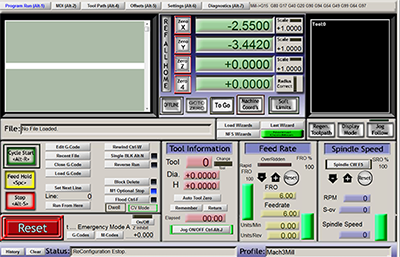 Then Download/install Mach3 software, and watch their tutorials to understand the application. 6. Why 4 Axis ? One is a X-Y Axis and the other set is a Z-A Axis. This enables you to cut tapered wings, or wings where two different airfoils are used on the same panel on each side, This gives the ultimate flexibility in hot wire cutting. 7. What Types of foam can be cut ? This is easy. Anything that can be cut using a hot wire, can be cut using this CNC. The temperature of the wire and speed may need to be set differently, but all types of EPS, EPO, EPP, XPS etc foam can be easily cut. At Vortex-RC there have been days, where we have cut huge blocks of foam continuously for 12 hours a day using this CNC. Its has been two years since we have been using this CNC. and have cut over 500 panels, and hundreds of sheets using this CNC. If built and operated correctly, your CNC will cut thousands of airfoils easily. 9. Drawer Slides, threaded rods and a wooden frame ? Are these accurate enough ? 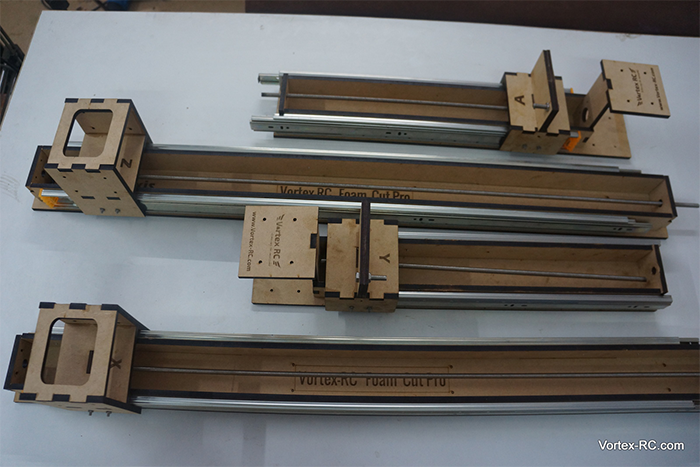 A Hot wire CNC is different from regular router/milling CNC. 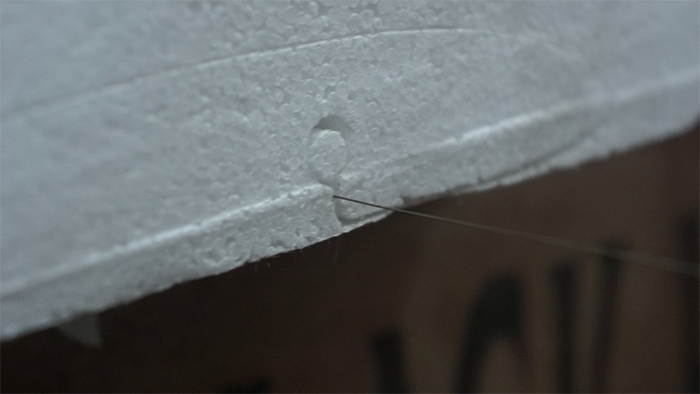 In a hot wire CNC, the wire does not touch the foam , and the foam is cut using the radiant heat of the wire. What this means is that during the cutting process there is wire little mechanical load on the frame of the machine. On the other hand a router/mill drags the bit across the part, wherein a lot of mechanical rigidity is required, which justifies use of mild steel, aluminium , cast iron frames. To reduce the backlash in a threaded rod, we have used a double nut design. This nearly reduces all of the backlash/slop from the assembly. DIY Reprap High Quality Prusa i3 3D Printer kit. Build your own fully functional 3D Printer with our DIY kit, which contains everything you need to get started. We feel it is rewarding to build one, and its a great learning experience. 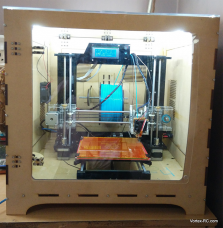 This version of Reprap Prusa i3 has been customized and developed in India, with all enhancements we felt were necessary in order to make a great 3D printer. We love our Reprap Prusa 3D printer, however there have been many times when the prints have been warped due to uneven cooling or drafts in the room make it hard for the the bed to heat up.